William H. Drinkard, an Alabama native, is a life long SF addict and novice SF writer. His main interest is SF novels with realistic alien cultures. He collects old books and first editions (non-SF, mostly 18th & 19th century works); he also collects Pre-Colombian Art and middle-eastern artifacts. He operates a consulting business. Drinkard earned a BS at Auburn University and a MBA at Jacksonville State University. I really loved this novel. 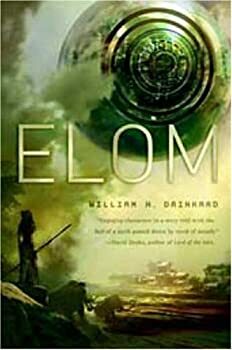 The blurb for Elom got me: "The Clan of the Cave Bear meets Close Encounters of the Third Kind." William Drinkard is not your typical debut novelist. He served in the Alabama State Legislature for twelve years, and even was the Senate Majority Leader. He's still involved with politics, but not as an elected official. When one hears such things, one wonders, "Yeah, but can he write?" In my opinion, the answer is a resounding yes. The novel starts when the young Geerna is preparing for the ceremony that will make her a woman. Her devotion to her goddess, Shetow, is unquestioned, so when light appears and when it takes her up to the heavens, she believes that she is going to Shetow.